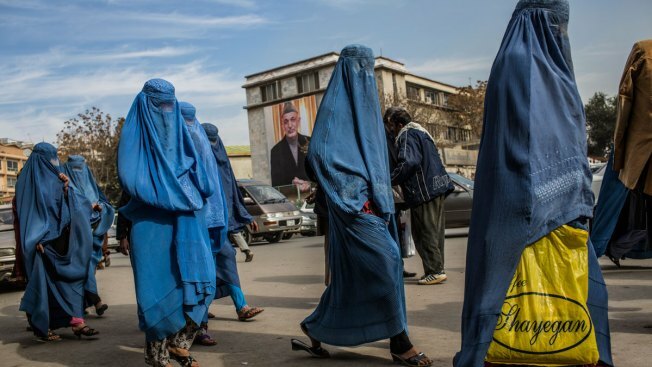 File image of Afghan women walking through the street, as a poster of President Hamid Karzai is seen on the outside City Hall on November 7, 2012 in Kabul, Afghanistan. A teacher has received death threats from his own relatives as he battles to stop the ancient tradition of families giving away virgin daughters to settle disputes. Khan Wali Adil has been camped out for more than three weeks in front of Afghanistan's parliamentary compound to protest the practice of "baad." The 24-year-old is urging lawmakers to pass women's rights legislation that would explicitly outlaw baad — which the U.N. has called "pervasive" but is most common among ethnic Pashtuns. The proposed law has been blocked by conservatives for years, NBC News reported. A 22-year-old victim of baad from the country's eastern Parwan province told NBC News how she was given to a man his late 40s — who was already married with eight children. The woman, who is not being named for her own safety, found herself used as a bargaining chip after her brother accidentally shot a man from their village over a land dispute.